This is a bit off topic but I just discovered aviary.com. If you haven’t checked out their image editing tools, give them a try. They are (for the most part) free, online and surprisingly powerful (for an online-only application). There is even an online community for sharing and discussing the final creations. 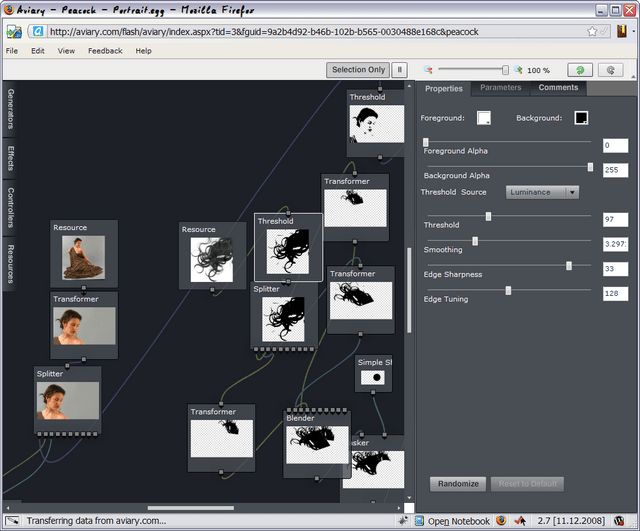 “Phoenix” is an image editor that not only allows for resizing and application of filters, it also has a layer-based manipulation capacity similar to Photoshop or Gimp. Similar layer-based editing is available in the “Raven“, a vector-based image editor like Adobe’s Illustrator. Extremely useful (especially for web designers) is “Toucan“, a color swatch editing tool. It has similarities with Adobe’s Kuler and allows for creating swatches based on a variety of color harmony principles. Furthermore, images can be loaded and used as a basis for new color pallettes. The final tool in the list is “Peacock“, which is a visual image manipulation tool that works with parametric modifiers. See the image below for an idea of how it works. Apparently there are more online applications in the works and there is also a “premium” subscription. Nevertheless, what’s there at this point loads fast and runs extremely stable on my machine and will undoubtedly serve as Photoshop replacement when I am not at my machine. To give you a full prespective here, it should be mentioned that there are other online image editors, too. These are for example Adobe’s Photoshop.com, Picnik and several quick-and-easy ones like DrPic.com.